Cycling in Europe: Deliveries by bike in city centres. 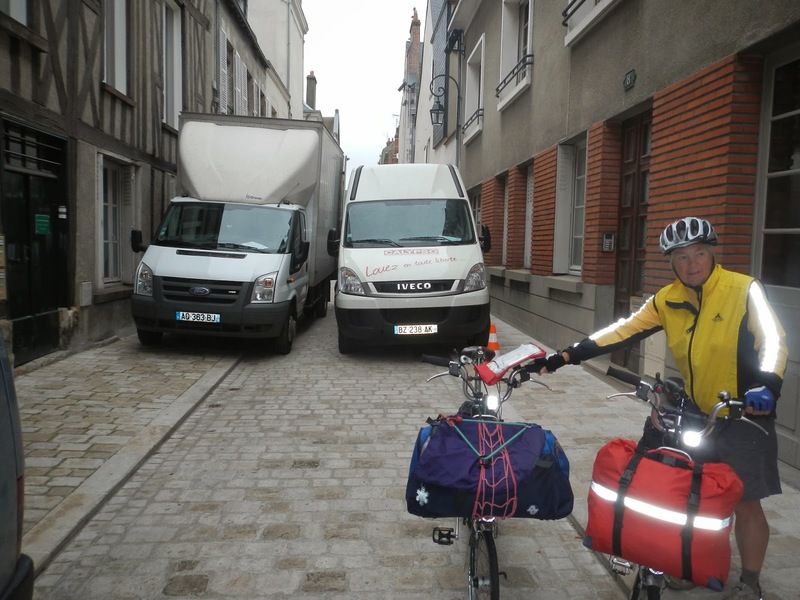 Two light delivery vehicles block a street in Orléans, France. Older city centres and many residential areas were not designed with modern traffic or goods deliveries in mind. Traffic delays are inevitable. These delays increase carbon dioxide output and reduce air quality because motors run for longer. This is as true for Germany as for anywhere else. The Bundesministerium für Umwelt, Naturschutz und Reaktorsicherheit (BMU - German Federal Environmental, Nature Protection and Nuclear Safety Ministry) has set up a programme to assess reducing the use of motor vehicles by courier companies in major city centres in the hope of reducing congestion, and hence lowering the emission of greenhouse gases and air pollutants. It is thought that up to 85% of local small deliveries at present made by small vans could be made by a pedelec cargo bikes. This “Ich ersetze ein Auto” - (I am replacing a van) programme is part of the National Climate Initiative where environmental and economic interests go hand in hand. The project supports use and development of new technologies in companies based in Germany, to increase competitiveness and create and secure jobs. The German government has clear aims when assisting industry. 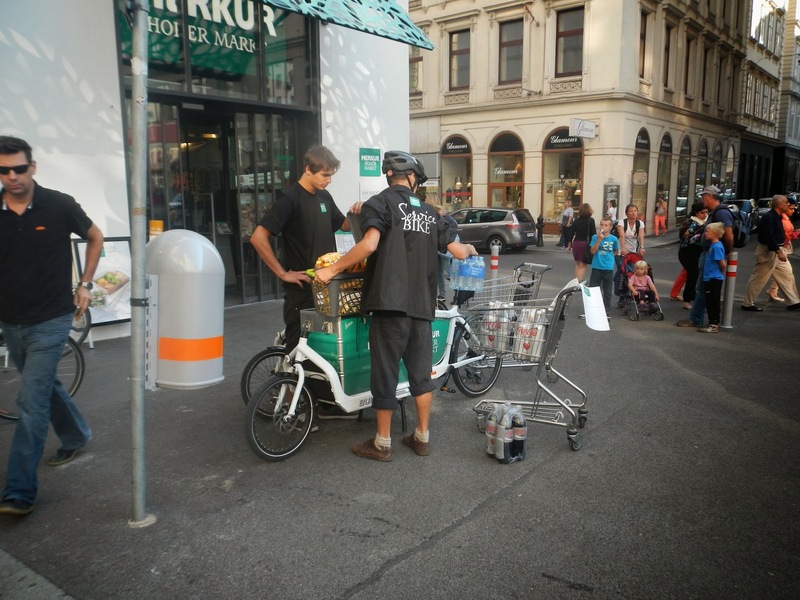 The Austrians have stolen a march on the Germans: Grocery deliveries in downtown Vienna, Austria. How effective is the replacement of light delivery vehicles by pedelec cargo bikes in reducing carbon dioxide emissions and environmentally damaging traffic in major cities? Which urban courier services offer the greatest potential for this transport? What percentage of light van courier services could be carried out by couriers on pedelec cargo bikes? What opportunities will arise from the use of pedelec cargo bikes for urban courier services and their clients? What are the factors influencing the switch to an pedelec cargo bike by self-employed couriers and messenger bike riders? The project is a very typical German government supported research programme involving government money, a project involving customers and manufacturers and a research organisation to manage the whole thing. The environmental ministry, i.e. the German taxpayer is coughing up the cash. 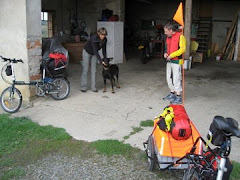 The customers are courier services. Independent and employed couriers and bike messengers in Berlin, Hamburg, Munich, Dusseldorf, Leipzig, Nuremberg and Bremen have agreed to use the pedelec cargo bikes in their daily work. Both car and bike couriers are interested in the project: The electrically powered project vehicles and major potential savings for car couriers make switching to an electric cargo bike an interesting alternative. The pedelecs are cheaper to buy, to operate and offer major savings on parking tickets. For the bike messengers, the electric motor provides direct competition in the market for car courier jobs. This means: Heavier goods can be transported over long distances, which generates more revenue for couriers with pedelec cargo bikes. DLR, the German national aeronautics and space research centre is responsible for project management and assessment. During the evaluation of the electric cargo bikes’ potential, order records and the routes followed are analysed. In addition, couriers, technicians, dispatchers and customers are being interviewed to gain information about the general acceptance. All the vehicles have the same appearance, including the logo "Ich ersetze ein Auto" (“I am replacing a van”) to raise the interest of further potential customers and users.